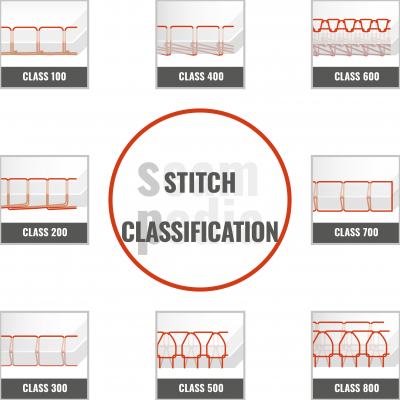 In the industrial confection, a sewing classification can made according to the type of stitch. But before continuing talking about stitches, we need to explain what a stitch is. 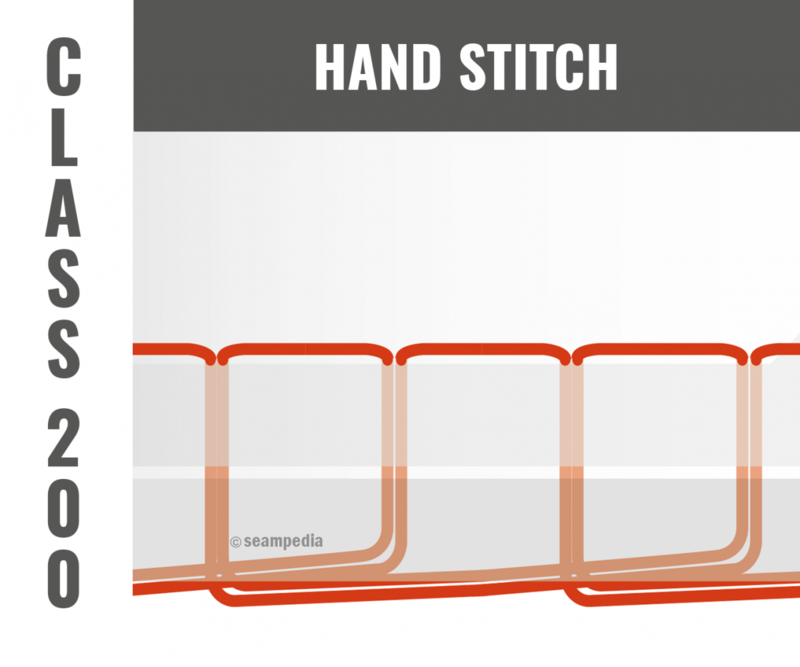 A stitch is made of an intertwined of one or several sewing threads in a specific repetition unit. 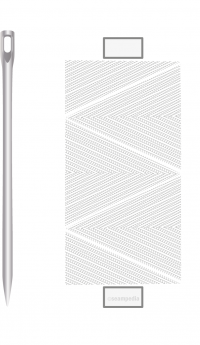 In addition, the seam will made by joining one or more fabrics through a sequence of stitches. That is, in a domestic sewing machine the stitch will be the result of interlacing the thread of the needle with the thread of the bobbin. The sequence of intertwining both threads will make the stitching. However, in the market we find different types of sewing machines that make different types of stitches. These stitches are made with one or more needles with a bobbin, anchor or shuttle. In the industry, we work with a standard classification denomination regulated by the ASTM. 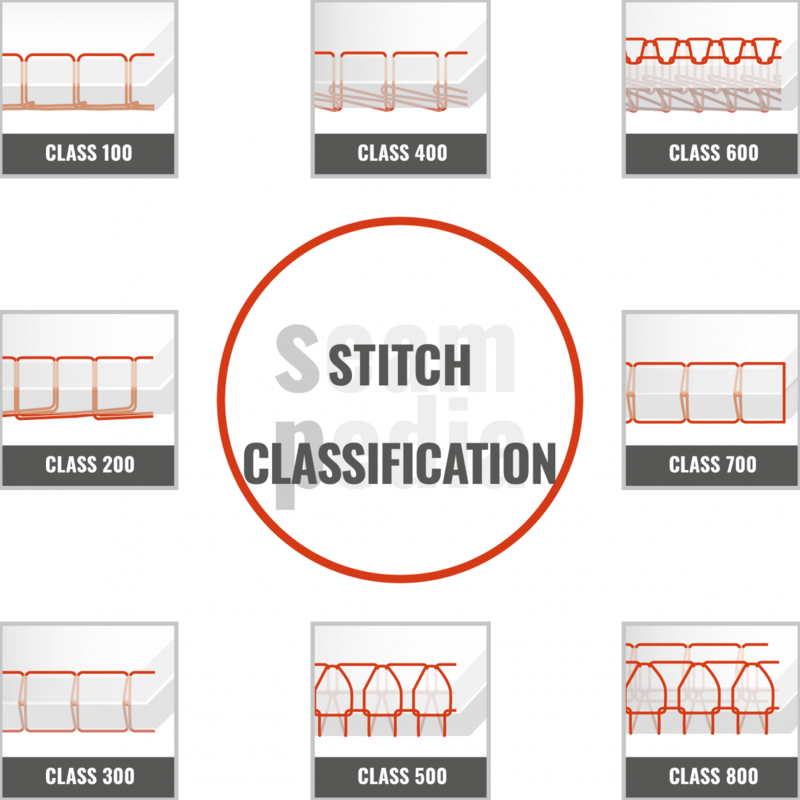 This classification organizes the different types of stitches into six main classes, plus two others added later. 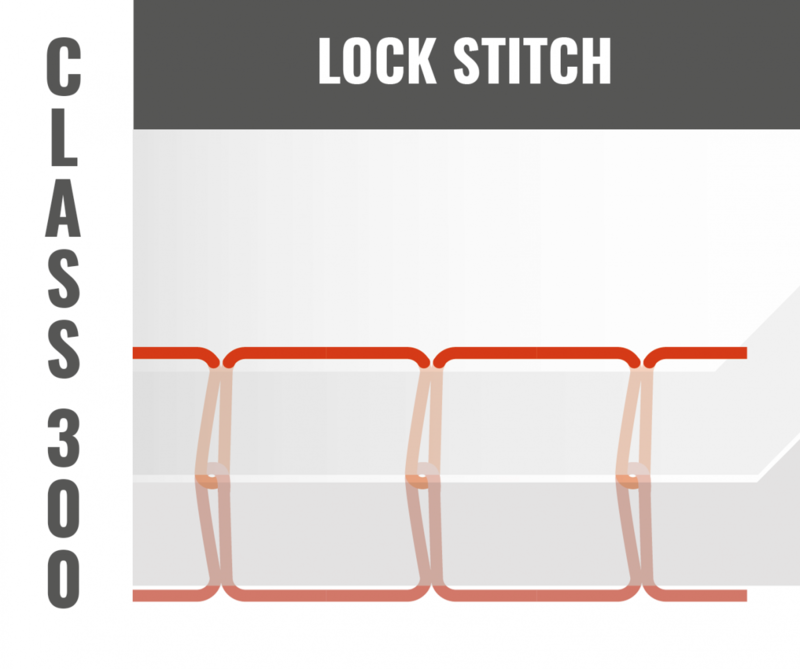 Each type of stitch is identified by three numeric digits. The first one identifies the stitch type, and the following two, the different combinations of that stitch according to the number of needles and threads used. It is made by one or several needles where the thread intertwines with itself, without the use of any bobbin. 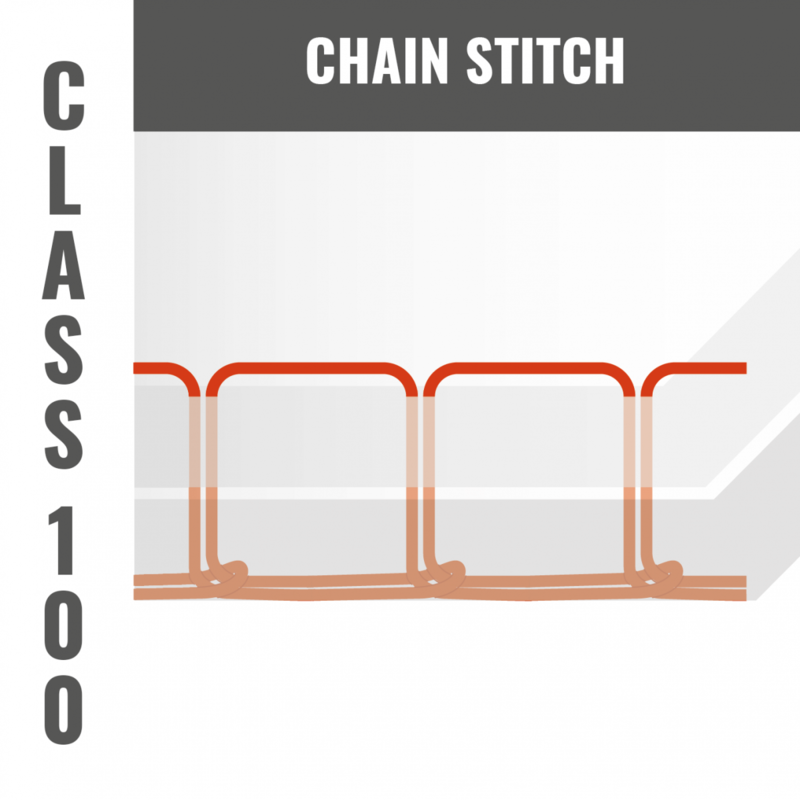 This type of stitch is characterized by having a certain elasticity and easily unstitching. Those stitches that are made with a single needle and a single thread. Made by hand or with a sewing machine that imitates the stitch by hand. 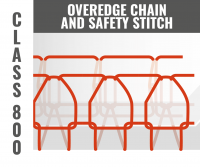 This type of stitches have many different shapes and uses. 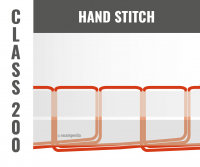 The 300 stitch class is made of two threads that intertwine with each other, and by using a needle and a quill. 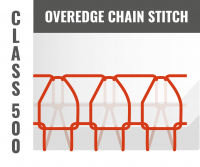 Double stitching is the most used for both domestic and industrial. The double stitching is characterized by having low volume, it is resistant, but with poor elasticity, and it doesn’t unstitch easily. Stitches in this class are made by one or more needles and two or more threads. 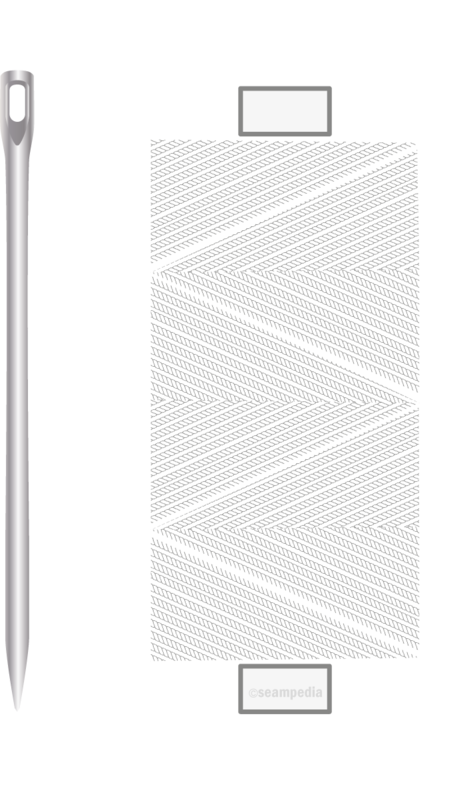 The threads of the second series are intertwined by dragging those of the first series towards the reverse of the seam. They require at least one needle and one anchor. This is the most used class after class 300. 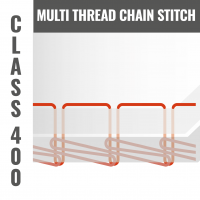 Multiple chain stitches have better elasticity and more volume than stitches into class 300. This type of stitch is formed by one or several needles and two or more threads interlaced at the edge of the fabric, creating an overcasting. The edge of the fabric is trimmed by a blade. A needle and two anchors are required to get this type of stitch. Some characteristics are low volume, good polishing of the fabric edge, and good elasticity. However, it is easily unstitched. It’s used on a large type of fabrics. 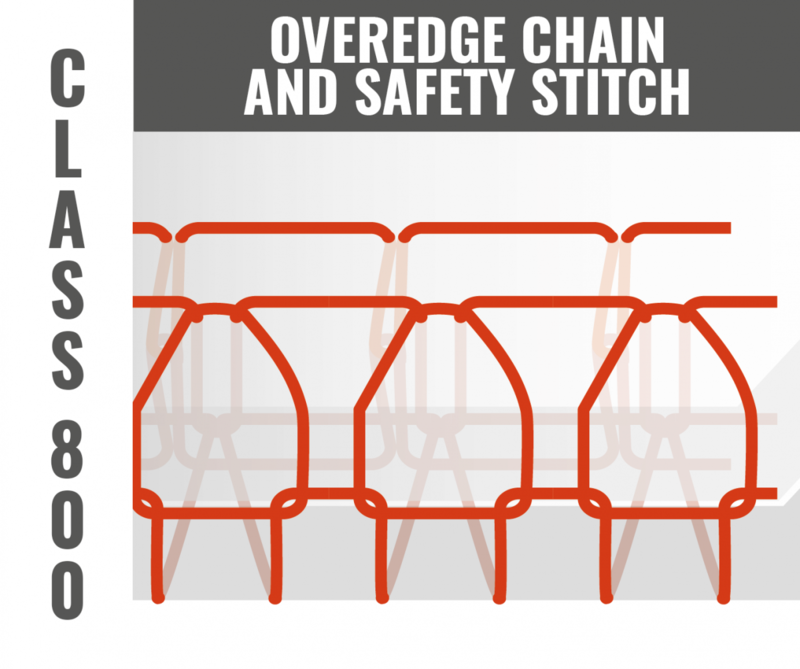 Class 600 is made of three groups of intertwining threads covering both sides of the fabric. 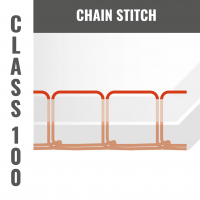 Stitches within this class have a high level of elasticity and resistance. They provide a flat seam that allows two layers of fabric to be joined together without overlapping. They also have a high production performance, but they consume a lot of thread. This group contains a single stitch class, 701. A continuous thread forms it. The thread bobbin is automatically filled with the one supplied automatically by the needle bobbin before starting the stitch cycle. 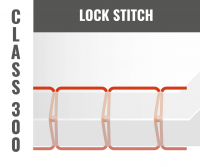 Is used only in seams of short sections, which allows the first stitch not to have loose ends being formed by the loop formed by a single thread. 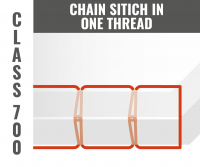 Machines that can make two or more rows of stitches of the other classes make stitches within this group. 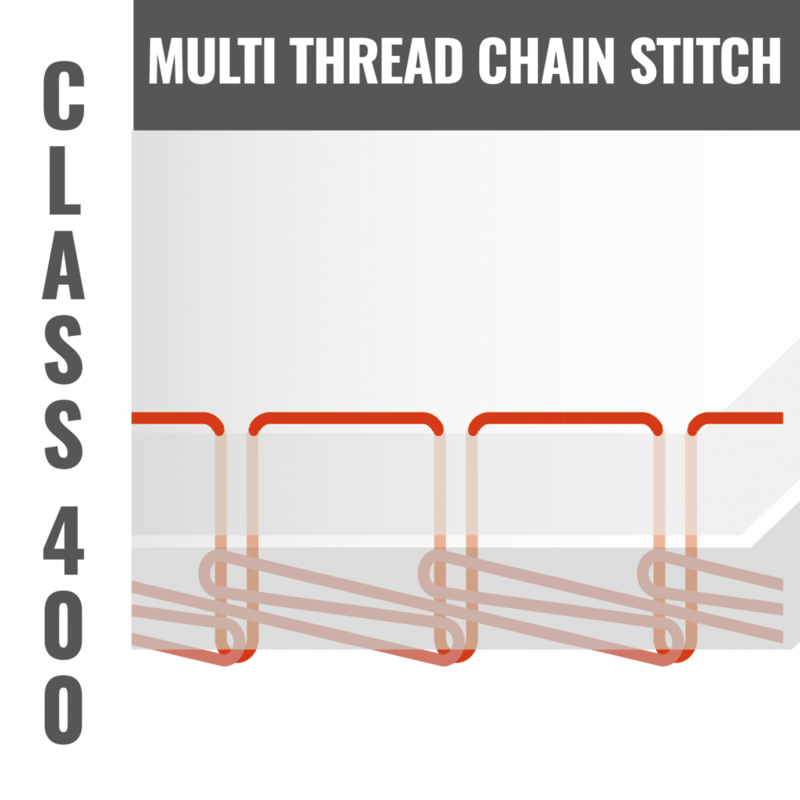 The most frequent can combinations are class 503, 504 or 602 with stitches of 301 or 401. 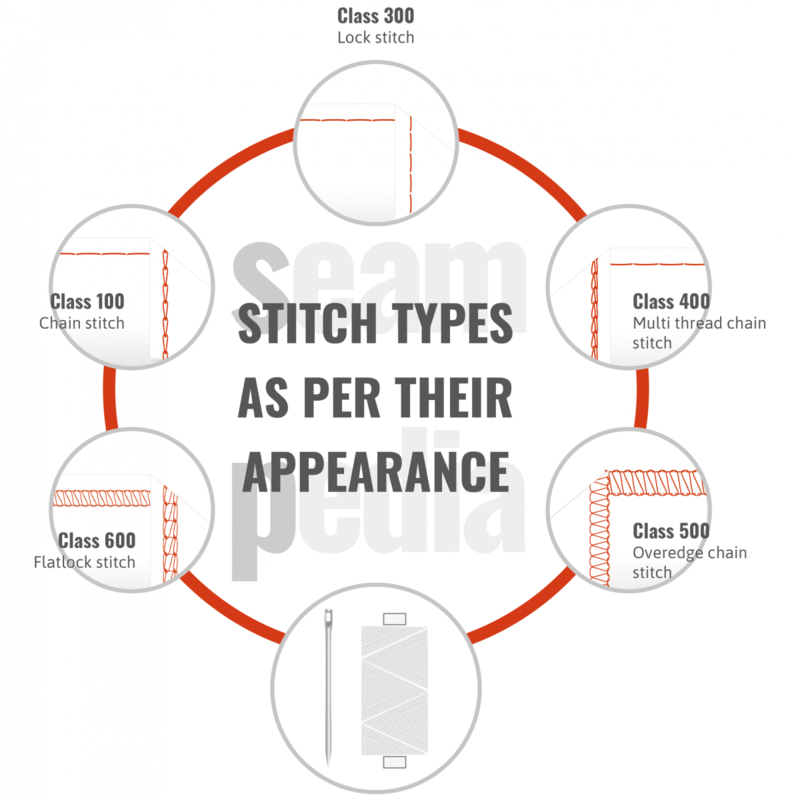 Each type of stitch has a particular appearance. Therefore, depending on whether one type of stitch or another is used, the seam will have a specific appearance and properties. 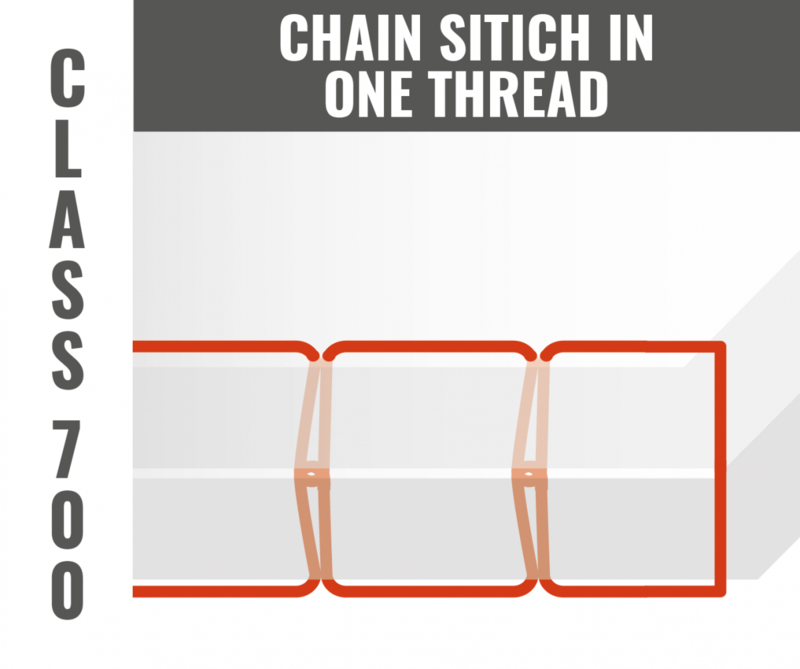 Chain Stitch: Its appearance on the right side is different from the wrong side. On the right side it makes a plain stitching, meanwhile, there is a kind of chain on the reverse. 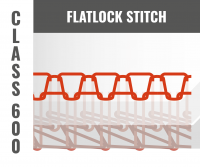 Lock Stitch: It has the same appearance on the right side as on the reverse, on both sides it makes stitching. Multiple Chain Stitch: Its appearance is different on the right from on the reverse. It makes a stitching on the right side and a double chain on the wrong side. 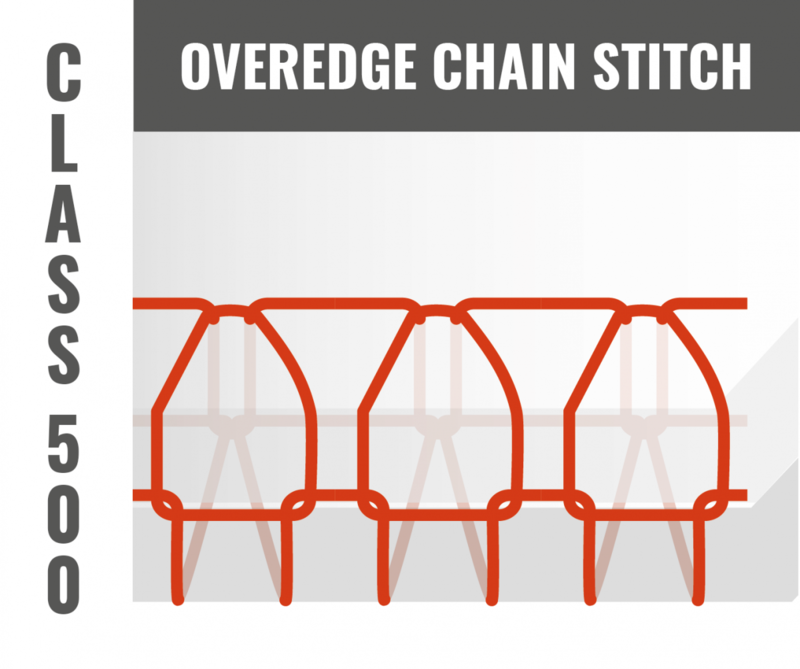 Overedge chain stitc: The overall stitch has a different look on the right side than on the reverse. 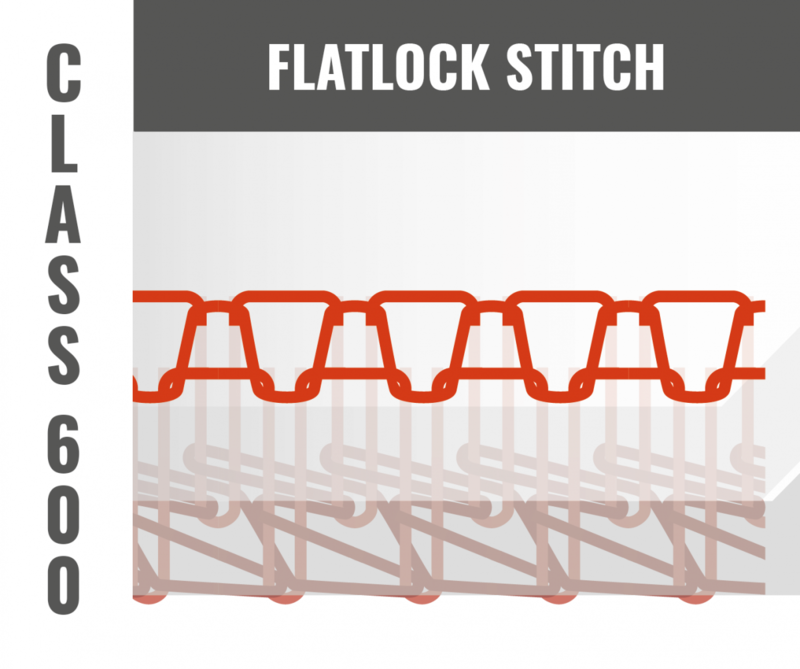 Cover or flatlock stitch:Its appearance is different on the right from the reverse. 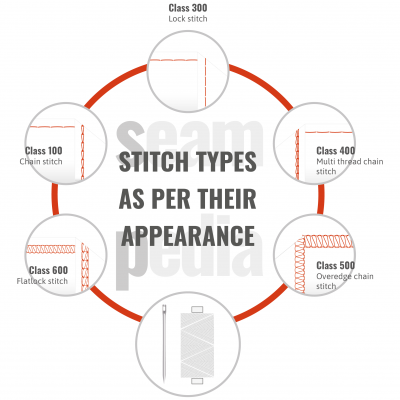 The seams can be defined according to the type of stitch used to make them. 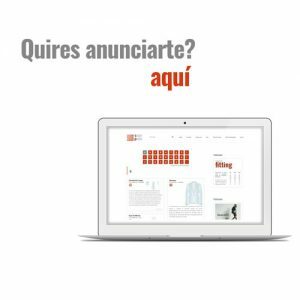 Is the country’s first organization of its kind.